Based in Palo Alto, CA, GrowthPoint Technology Partners is a technology investment bank that provides financial and advisory services to technology companies around the world. With hundreds of completed transactions to their name, GrowthPoint was outgrowing their current website which wasn’t doing anything to strengthen their brand image. After initially planning to work with a larger firm, GrowthPoint chose Ha Design for our boutique-level service and unique design abilities. The new website was to have a robust Content Management System (CMS), video and article library, and a news feed. It was also very important for the website to be responsive so it would display well on mobile devices. We went right to work, first coming up with the new look and feel, which was well received and quickly approved. Page by page, we worked closely with the client to build out the website, keeping important goals in mind such as ease of use, content organization and flow, and consistency of style. The new website tells a visual story about GrowthPoint and their flair for “getting the deal done” for clients. The new interactive video and article library contains a plethora of valuable content, featured in a visual and organized gallery. The Transactions page showcases a list of transactions and big-name clients and the Team page shows all of the team members and their impressive bios. We combined crisp imagery with bright colors and bold type to give the website a modern look with a slight edge. Best of all, the client is able to easily manage all of the website content and add new videos and articles. 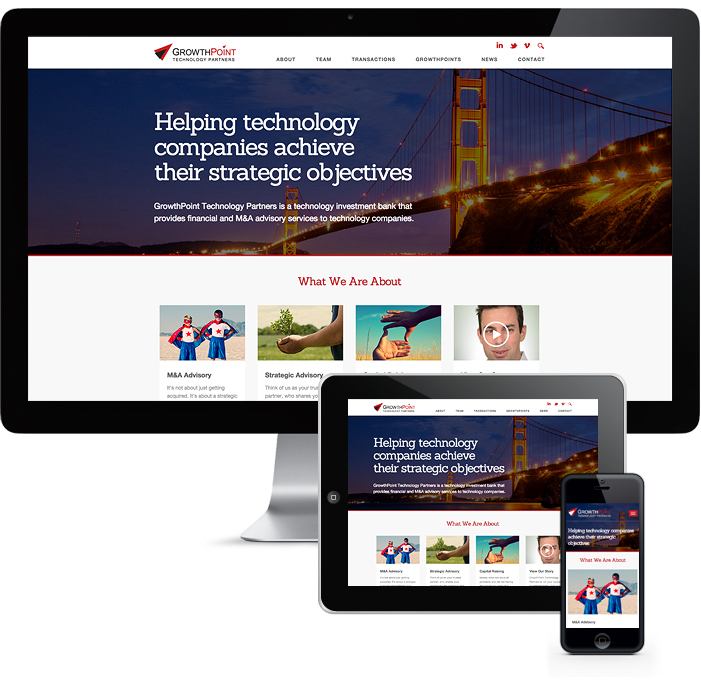 A modern website for a modern company, we made sure to include social media links and feeds. Users can even share content on social media. Last but not least, the website displays beautifully on a number of mobile devices. Explore the site further and let us know what you think!